What can I learn from food labels? I am often asked about how to read food labels. I understand that the information on a food label can be confusing, and you may not know how it relates to your requirements. In this post, which is an excerpt from Eating for You, I have outlined the type of information included on a label. 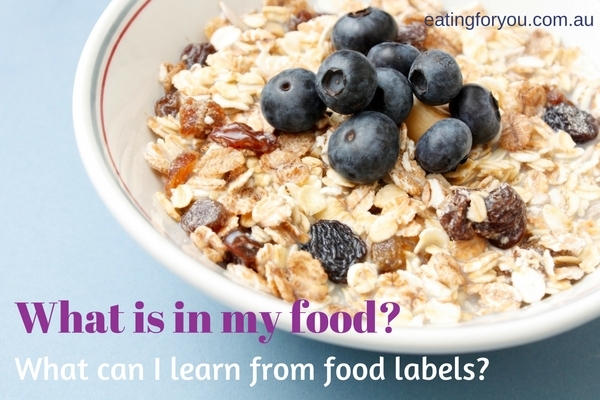 This is part 1 of my series on reading food labels. Australia and New Zealand have a clean and safe food supply due to clear guidelines outlined by the Food Standards of Australia New Zealand (FSANZ). These guidelines include what foods must contain to be called a certain food product, permissible ingredients and what is required on the labels of packaged foods. Other countries have guidelines too. These can be located by conducting an internet search for ‘food labels’ or ‘reading food labels’ in your country of interest. Weights and measures provided on labels must be accurate. Food labels must not contain information that is false or misleading in their representations, for example if a food label has a picture of apples on it, the food product must contain apples. Fair Trading laws and food laws oversee this requirement. 1 teaspoon sugar weighs 4g. 1 teaspoon salt weighs 5g and contains 2000mg of sodium. 1 teaspoon of butter or margarine weighs 5g and contains 3.5 to 4.1g of fat. 1 teaspoon of oil, such as olive oil weights 4.5g and contains 4.5g fat. * Percentage Daily Intakes are based on an average adult diet of 8700kJ. Your daily intake may be higher or lower depending on your energy needs. Ingredients Rolled oats, walnuts, sultanas, sunflower seeds, oat bran, rolled barley, rice flakes. ALLERGEN INFORMATION Contains gluten containing ingredients as indicated in bold type. May contain traces of other gluten containing ingredients, peanut and other tree nuts due to shared equipment. We proudly use Australian ingredients – only when an Australian ingredient is not available an imported one is used. Store in a cool dry place. Refrigeration will ensure maximum freshness and quality up until the best before date. Name or description of the food for the example product is muesli. Nutrition information panel lists information on nutrients per serve and per 100g of product. You might like to convert weights to teaspoons, as outlined above. The panel also provides the %Daily Intake (%DI) of nutrients per serve. For example, one serve of Hartley Muesli provides 16% of the daily intake for fibre. The Daily Intake Guide or %DI refer to a set of nutrient reference values, based on average adult requirements identified in the National Nutrition Survey (1995). Ingredients list records the ingredients in descending order, largest to smallest in quantity. The ingredient present in the largest amount in the muesli is rolled oats and the smallest is rice flakes. Food additives are listed in the ingredients, using either the function and name or code. There are no food additives in the muesli. Date marking relates to both quality and safety of the product. Foods, such as Hartley Muesli, that have a shelf life of less than two years have a ‘best before’ date. Foods are still safe to eat after the ‘best before’ date but their nutritional value and quality may have declined. A ‘use-by-date’ indicates when a food should no longer be consumed due to health and safety reasons. Bread is the only exception to these rules as its shelf life is less than 7 days. Bread may be labelled ‘baked on’ or ‘baked for’. Country of origin information identifies products that have been made from Australian and imported ingredients. The muesli is labeled ‘Made in Australia’, which means that it has been made in Australia with a significant amount of imported ingredients. Often it is difficult for Australian manufacturers to source Australian ingredients all year round. Products marked ‘Product of Australia’, have been made in Australia from Australian ingredients. The country of origin guidelines are currently being reviewed in Australia. Consumers are seeking more information about where food product ingredients come from. Food recall information includes the contact details for the manufacturer or importer as well as the lot identification number for the food. The number is located near the date mark. In my next post I will provide guidelines on how to use the information on food labels to choose healthier foods. I will discuss sugar, fat, fibre and salt. I will show you how to compare different products using the nutrition panel and ingredients list. If there are products that you would like me to include in my review, please leave a comment or question below. 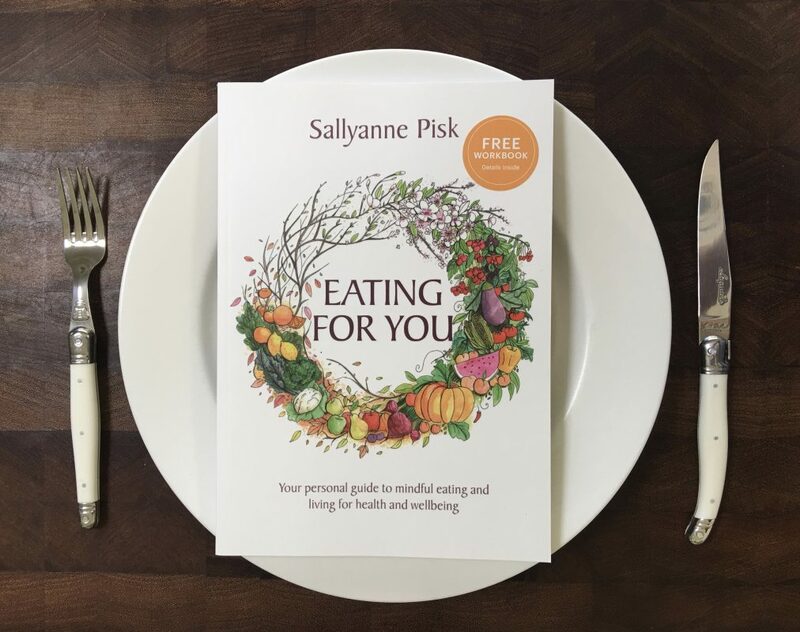 Eating for You offers practical information and tips to choose foods that best suit you.